When we Presbyterians talk about the nature of God, we sometimes use the term Sovereign Love. These two words help maintain an important tension in who we understand God to be. God is sovereign, indicating that God’s activity in creation, providence, and ultimate things has a certain mystery about it that we cannot fully understand, but which we trust. God is love, made known in the compassion of Jesus Christ, a compassion so complete that through the cross, Jesus revealed the saving power of Sovereign Love toward all. Our worship begins with the ringing of a bell, the lighting of candles, and a musical meditation, typically on the organ. We then sing a hymn of praise as our choir and pastor process into the church’s chancel. The procession is in keeping with the Psalms of Ascent, such as Psalm 122 that speak of the faithful “going up to Jerusalem.” Then follows the opening sentences, “Our help is in the name of the Lord, the maker of heaven and earth.” This statement, from Psalm 124:8, has been used at the opening of worship by Presbyterian/Reformed Christians since the time of John Calvin in the 1530s. Next is the prayer or collect for the day, a prayer which touches on the theme of that particular worship service or the season of the church year. Next comes a prayer of confession prayed by all, followed by time for silent prayers of confession. The pastor then assures all of God’s pardon in Christ through an appropriate scripture selection. We then rise to express our thanksgiving for God’s pardon through the singing of another hymn and the passing of the peace, which is not simply “saying hello” to fellow worshipers but celebrating God’s forgiveness to each and to all. We then share concerns of the church and the pastor has a brief time with the children of the church at the baptismal font. We then have four Scripture lessons: Old Testament, Psalm, Epistle and Gospel. These are almost always from the Revised Common Lectionary, used by many Protestants. Interspersed among these readings may be a musical anthem by the choir or another hymn. The sermon then follows, taken from one or more of the scripture readings for the day. After the sermon we sing a hymn that generally reinforces the theme of the sermon. We then say the Apostles or Nicene Creed, each of which are brief summaries of Christian faith, which were developed in the early centuries of the church. A Gloria then follows, which is a musical setting of praise to the Trinity. Then follows the pastoral prayer and the Lord’s Prayer, the offering, the Doxology, Benediction, and recessional hymn, in which again the choir and pastor move from the chancel area to the back of the church as a symbol of our going forth from worship into the world. About ten Sundays per year the Sacrament of the Lord’s Supper is celebrated following the offertory and Doxology. We celebrate this sacrament once during each season of the church year – Advent, Christmas, Epiphany, Lent, Easter, and Pentecost, as well as on World Communion Sunday and All Saints Sunday. We also celebrate the sacrament of baptism, including infant baptism, when candidates or their parents have been approved by the church session to receive the sacrament. 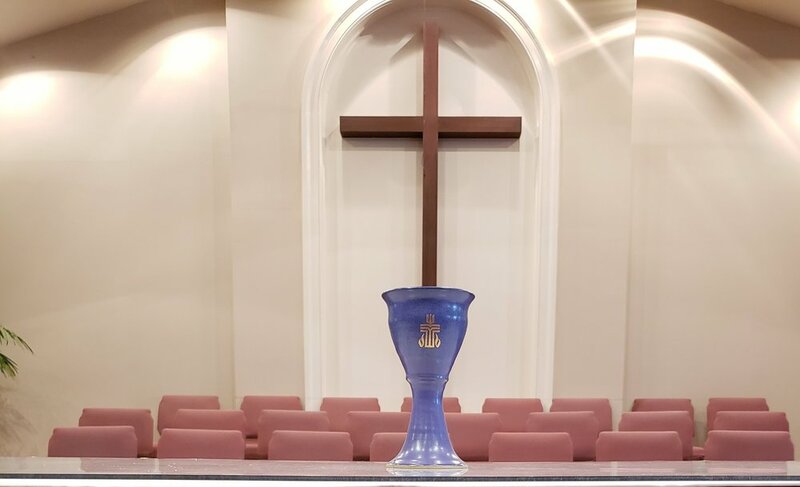 In addition to Sunday worship, each year we also have special worship services on Ash Wednesday, Maundy Thursday, Good Friday, and Christmas Eve. We are located at 6671 Yale Rd in Bartlett, TN, just west of Kirby Whitten Parkway. There are two driveways to access our parking lot; the driveway on the west side (farthest from Kirby Whitten) is closest to the sanctuary. Handicapped parking and visitor parking is available on the west side. A covered awning and ramp are also located at the west entrance. The sanctuary is on the south side of the building. You can enter through the exterior doors on each side of the sanctuary, or through the building using the west side entrance. Ushers will be available to greet you and provide you the day’s bulletin. Our sanctuary seating is made of high-backed cushioned chairs arranged in rows. Spaces for wheel chairs are available in the front of the east side of the sanctuary (baptismal font side), and along the outside aisles. We have ushers available to assist you at any time during the service. Children are welcome to attend our worship service. If preferred, children birth through kindergarten are able to attend our nursery, located on the west side hallway. Children’s bulletins and coloring books are available in the back of the sanctuary. After the passing of the peace, about 15 minutes into the service, children are invited to bring their Ringing Offering to the baptismal font and have a brief time with the pastor. Then they may return to their seats for the rest of the service, go to the nursery, or attend Children’s Church. Children’s Church is a 30 minute program for kindergartners through 3rd graders to sing praise songs, hear a Bible story, engage in learning activities, and pray. The children then return to the service to participate in the offering, benediction, and closing hymn.